The Genesis Framework by StudioPress is a popular premium WordPress theme subscription service which gives you instant access to dozens of child themes. If you don’t already know what that means, a child theme is a theme that inherits the functionality of a parent theme; you can further modify and customize the child theme in order to create a unique theme. The Genesis Framework comes with a lot more than themes, however-it also comes with a foundation for your website and includes great SEO value, widgets, and layout options, support and more. StudioPress is a US-based company that has been in operation since 2009 and has a very high Google PR of 8. Their website receives a ton of traffic because their themes and framework are very popular. This is one of the few companies TopFiveAdvisor has looked into which offers a thirty-day money-back guarantee. StudioPress has received many accolades for their Genesis Framework, and was called “best of the best” among WordPress premium framework providers by Mashable. Genesis is a very popular and has a huge community following. Price includes 46+ child themes, unlimited websites, and unlimited updates. Built-in SEO, custom widgets, and security. Genesis may have an uncomfortable learning curve if you want to take the design of your blog beyond what their child themes offer you. Documentation appears to be lacking for manual customizations. 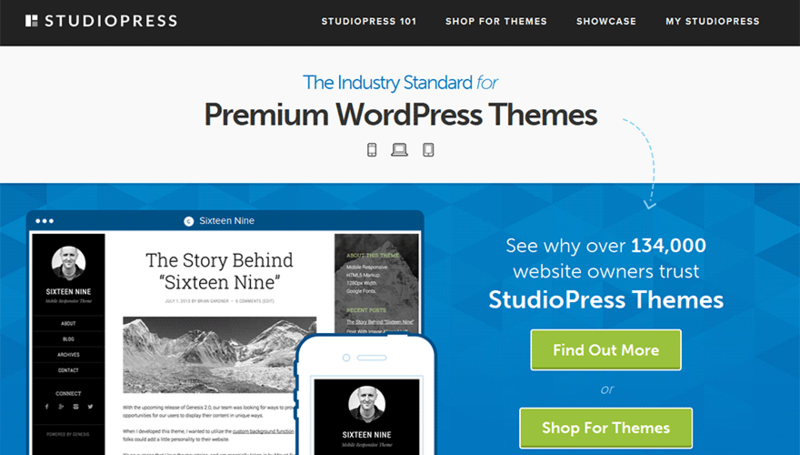 StudioPress sells their themes separately, but only offers one all-in-one package. The Pro Plus All-Theme Package costs a one-time payment of $349.95 and includes all of the themes StudioPress has created along with the Genesis Framework and all of the themes the company will create in the future. There are no recurring fees, which is definitely an appealing aspect of this package. Purchasing all the themes as part of the package (instead of separately) results in over $800.00 of savings. All themes and other elements are released under the GPL license, and you may use the themes across unlimited sites. The package includes full theme support and lifetime updates. The quality of the Genesis themes is very high, with some themes developed for general use and others for specific applications. For example, AgentPress is specifically designed for real estate agents while Lifestyle is built for online magazines. Corporate is built for any professional business to use, while Crystal is designed to show off photos and other images. Family Tree is designed to help you showcase special moments, and Mindstream is created for blogging. The fact that there’s something for everyone here is definitely a plus, especially if you operate a web design business and regularly build websites for diverse clients. Whether a client wants a website for their family tree or wedding announcement or for their new startup real estate business or photography business, you’ll be able to find a great format effortlessly. You can also customize the themes you purchase to your heart’s content using the many theme options which are available to you and the plugins and widgets which are available to enhance the sites you create. An example of StudioPress quality can be seen with their recent themes called Metro. This theme provides an ultra-wide layout for more screen real-estate while still providing an excellent responsiveness in your browser. See this screencast demonstration we found that shows you how to configure Metro to look like the demo. This video will give you a full understanding of how this theme works. When you purchase one of the Genesis themes, you need to purchase the Genesis framework in order to modify the theme options. The theme plus the framework costs more than $70.00 (so you can see immediately why the package results in massive savings). You’re given a number of layout options, a customizable backdrop and header, footer widgets, featured images, threaded comments, and more. PSD layered graphics are available for easy modifications. Detailed tutorials on the site teach you how to use the Genesis framework, though most of the theme settings are very intuitive. You don’t need to know code to use the Genesis user interface, which makes it simple to modify fonts and sizes, categories, posts and more with a click. It’s also effortless to add in WordPress widgets in order to add more functionality to your websites. StudioPress has created numerous different plugins for WordPress which can be used for specific purposes. For example, if you’re creating a real estate website, you can use the AgentPress Listing plugin to add listings to your site and make those listings searchable to site visitors. If you’re building a social network, you can use Genesis Connect to streamline the process. You can also use the Social Profiles Widget to insert links to your social profiles. While some plugins are free, others may cost an extra fee. Genesis appears to offer great customer support. Aside from the poor documentation for manual customizations, there are many in-depth tutorials including video tutorials, and a support system that includes an email/ticket system for specific inquiries to the staff. An updates blog and social networking features helps you keep up with the latest and meet fellow developers and resolve problems together. There is one more drawback, which is that while this package includes 46 themes, the cost per theme is pretty high at $7.78 per theme. Most other theme clubs we’ve looked into have much lower prices per theme, and some of the best packages we saw included themes at less than $3.00 per theme. Ultimately the price value is the only factor that has really brought down our overall ranking from a perfect score. You’re getting a lot more in that cost than just the themes, however, including excellent customer support features, lifetime updates, and unlimited licensing. The themes themselves are of an excellent caliber. In conclusion, TopFiveAdvisor gives Genesis a 9/10 for clean and effective designs and a great subscription service which can provide you with a superb starting point for your new or existing blog.